The Black & Gold Wash & Fold laundromat in my neighborhood has a problem. The new ownership has been in place only a year or so. It started off gangbusters–a new black and gold paint job, new machines, flags, a months long grand opening, a cleverly constructed dry erase board display with a PVC pipe skeleton–but I fear the management team has grown complacent. 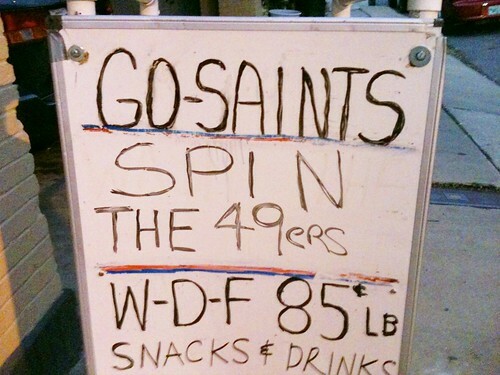 The dry erase board display, as seen in the photo on the left, seems intended, at least in part, to further connect to the clear inspiration for the laundry’s name, the New Orleans Saints. In an inspired move, the good people at the Black & Gold Wash & Fold sync their dry erase board message with the upcoming game. That’s all fine and good. 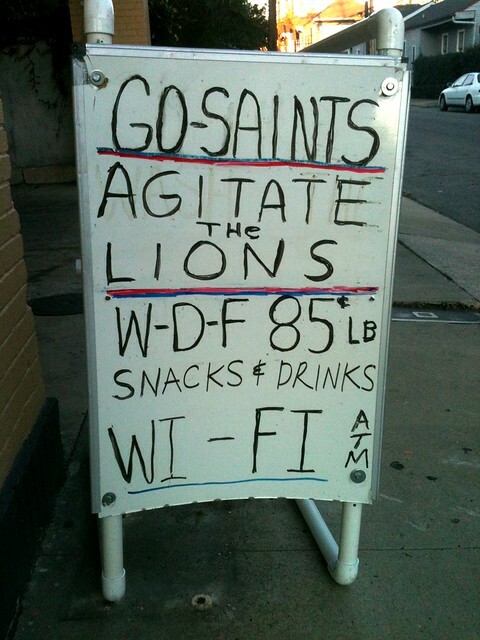 However, as you can see, they’ve set it up so the Saints are always washing the opponent. Saints washing Falcons? No good can come of it. Early in the season I think they tried a couple other words aside from “wash” but were equally uninspired (I can’t even remember them). Here’s a case where a little planning would’ve gone a long way. At the start of the season, list out your laundry-themed verbs and match them up. Bim-Bam-Boom. But I do not aim to criticize. They’ve got quarters to move, they’re not slinging words. I invite suggestions in the comments for the remaining games in the season, and once I have a sufficient collection of alternative verbs, I will walk them over to the Black & Gold Wash & Fold, free of charge. I confess to a certain uneasiness with doing anything laundry-related to lions, falcons and panthers. press, as in permanent press, but this sounds better for basketball. spin could work. Soak, if the game is played in the rain. scrub, hang, as in hang out to dry, but the whole idea of a dryer is defeated. Iron might fit ever now and then. Let’s see what others come up with. I accept your challenge for ideas for the eraser board. Come in between 10:30am and noon and give me a slogan for the playoff games. If it’s good you get a free wash and fold. Ask for Carl.